One of the biggest mistakes I see (and am guilty of making) is assuming a client is knowledgeable, bought-in, and motivated to execute search work simply because they agreed to pay us to do it. We start trucking full-speed ahead, dumping recommendations in their laps, and are surprised when the work doesn’t get implemented. We put the cart before the horse. It’s easy to forget that clients start at different points of maturity and knowledge levels about search, and even clients with advanced knowledge may have organizational challenges that create barriers to implementing the work. Identifying where your client falls on a maturity curve can help you better tailor communication and recommendations to meet them where they are, and increase the likelihood that your work will be implemented. How mature is your client? No, not emotional maturity. 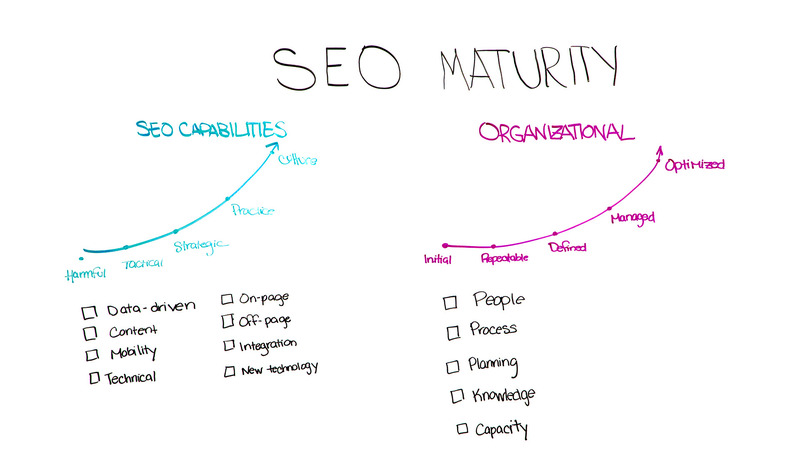 Search practice maturity. This article will present a search maturity model, and provide guidance on how to diagnose where your client falls on that maturity spectrum. This is where maturity models can help. Originally developed for the Department of Defense, and later popularized by Six Sigma methodologies, maturity models are designed to measure the ability of an organization to continuously improve in a practice. They help you diagnose the current maturity of the business in a certain area, and help identify where to focus efforts to evolve to the next stage on the maturity curve. It’s a powerful tool for meeting the client where they are, and understanding how to move forward together with them. 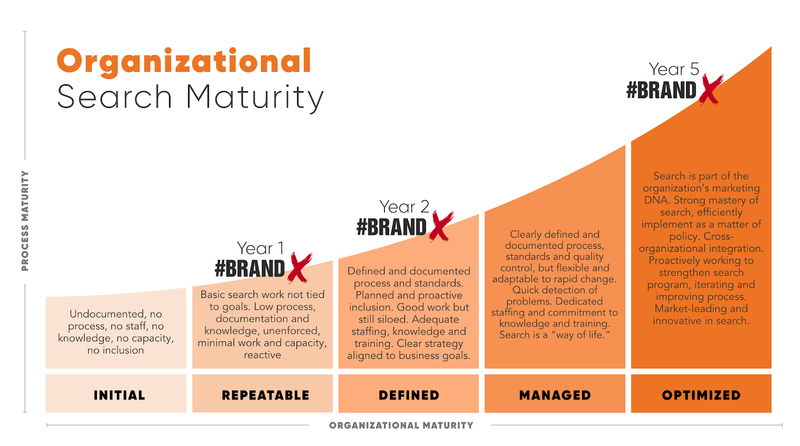 For search, we can think about a maturity model two ways. One is the actual technical implementation of search best practices — is the client implementing exceptional, advanced SEO, just the basics, nothing at all, or even operating counterproductively? This can help you figure out what kinds of projects make the most sense to activate. 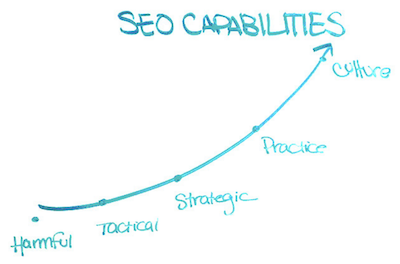 The second way is the organizational maturity around search engine optimization as a marketing program. Is the client aligned to the importance of organic search, allocating budget and personnel appropriately, and systematically integrating search into marketing efforts? This can help you identify the most important institutional challenges to solve for that can otherwise block the implementation of your work. 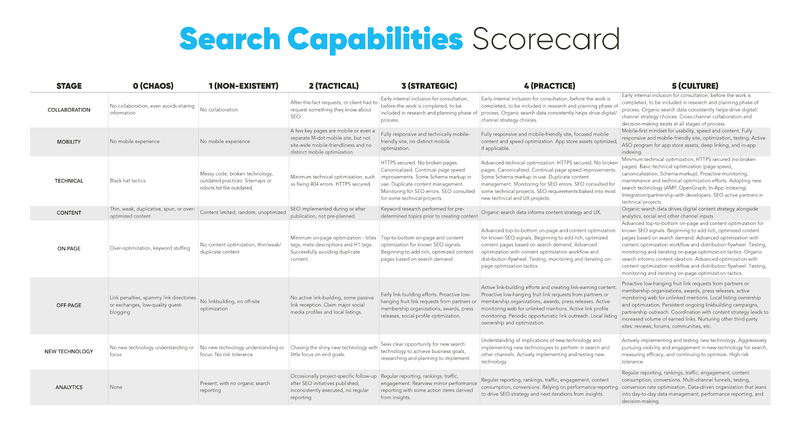 First, let’s dive into a maturity model for search knowledge and capabilities. Collaboration – how well relevant stakeholders integrate and collaborate to do the best work possible, including inside the organization, and between the organization and the service providers. Mobility – how mobile-friendly and optimized the brand is. Technical – how consistently foundational technical best practices are implemented and maintained. Content – how integrated organic search is into the digital content marketing practice and process. On-page – how limited or extensive on-page optimization is for the brand’s content. Off-page – the breadth and depth of the brand’s off-site optimization, including link-building, local listings, social profiles and other non-site assets. New technology -the appetite for and adoption of new technology that impacts search, such as voice search, AMP, even structured data. Analytics – how data-centric the organization is, ranging from not managed and measured at all, to rearview mirror performance reporting, to entirely data-driven in search decision-making. Stage 0 (Counterproductive) – The client is engaging in harmful or damaging SEO practices. Stage 1 (Nonexistent) – There is no discernible SEO strategy or tactical implementation, and search is an all-new program for the client. Stage 2 (Tactical) – The client may be doing some basic SEO best practices, but it tends to be ad hoc inclusion with little structure or pre-planning. The skills and the work meet minimum industry standards, but work is fairly basic and perhaps not cohesive. Stage 3 (Strategic) – The client is aligned to the value of SEO, and makes an effort to dedicate resources to implementing best practices and staying current, as well as bake it into key initiatives. Search implementation is more cohesive and strategic. Stage 4 (Practice) – Inclusion of SEO is an expectation for most of the client’s marketing initiatives, if not mandatory. They are not only implementing basic best practices but actively testing and iterating new techniques to improve their search presence. They use performance of past initiatives to drive next steps. Stage 5 (Culture) – At this stage, clients are operating as if SEO is part of their marketing DNA. They have resources and processes in place, and they are knowledgeable and committed to learning more, their processes are continually reviewed and optimized, and their SEO program is evolving as the industry evolves. They are seeking cutting-edge new SEO opportunities to test. While this maturity model has been peer reviewed by a number of respected SEO peers in the industry (special thanks to Kim Jones at Seer Interactive, Stephanie Briggs at Briggsby, John Doherty at Credo, Dan Shure at Evolving SEO, and Blake Denman at Rickety Roo for your time and expertise), it is a fluid, living document designed to evolve as our industry does. If necessary, evolve this to your own reality as well. 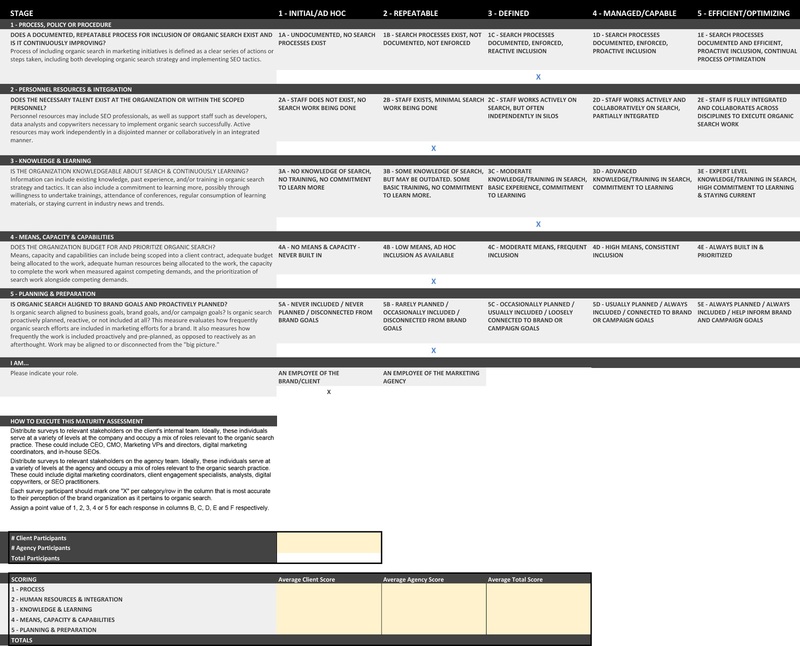 You can download a Google Sheets copy of this maturity model here to begin using it with your client. 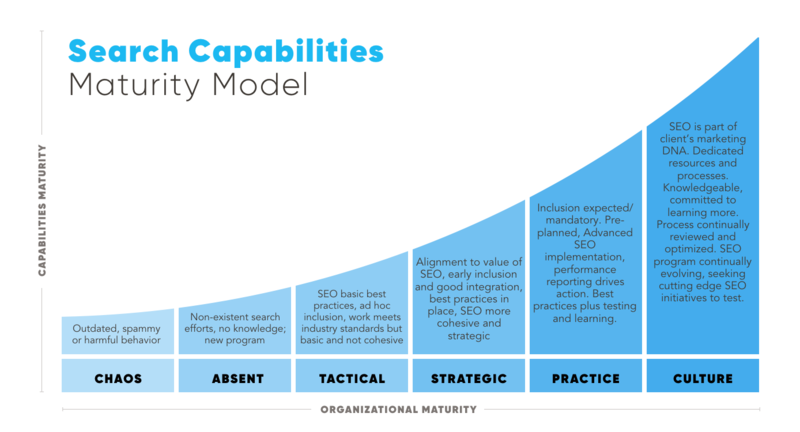 In this search capabilities maturity model, I added an unconventional “Stage 0 – Counterproductive,” because organic search is unique in that they could do real damage and be at a deficit, not just at a baseline of zero. In a scenario like this, the client has no collaboration inside the company or with the partner agency to do smart search work. Content may be thin, weak, duplicative, spun, or over-optimized. Perhaps their mobile experience is nonexistent or very poor. Maybe they’re even engaging in black hat SEO practices, and they have link-related or other penalties. For a client that is starting on the lower end of the maturity scale, you may not recommend starting with advanced work like AMP and visual search technology, or even detailed Schema markup or extensive targeted link-building campaigns. You may have to start with the basics like securing the site, cleaning up information architecture, and fixing title tags and meta descriptions. For a client that is starting on the higher end of the maturity scale, you wouldn’t want to waste their time recommending the basics — they’ve probably already done them. You’re better off finding new and innovative opportunities to do great search work they haven’t already mastered. But technical capabilities and knowledge are only beginning to scratch the surface with clients. This starts to solve for what you should implement, but doesn’t touch why it’s so hard to get your work implemented. The real problems tend to be a lot squishier, and aren’t so simple as checking some SEO best practices boxes. How mature is your client’s search practice? The real challenges to implementation tend to be organizational, people, integration, and process problems. Conducting a search maturity assessment with your client can be eye-opening as to what needs to be solved internally before great search work can be implemented and start reaping the rewards. Pair this with the technical capabilities maturity model above, and you have a powerhouse of knowledge and tools to help your client. Before we dig in, I want to note one important caveat: While this maturity model focuses heavily on organizational adoption and process, I don’t want to suggest that process and procedure are substitutes for using your actual brain. You still have to think critically and make hard choices when you execute a best-in-class search program, and often that requires solving all-new problems that didn’t exist before and therefore don’t have a formal process. Process, policy, or procedure – Do documented, repeatable processes for inclusion of organic search exist, and are they continually improving? Is it an organizational policy to include organic search in marketing efforts? This can mean that the process of including organic search in marketing initiatives is defined as a clear series of actions or steps taken, including both developing organic search strategy and implementing SEO tactics. Personnel resources & integration – Does the necessary talent exist at the organization or within the service provider’s scope? Personnel resources may include SEO professionals, as well as support staff such as developers, data analysts, and copywriters necessary to implement organic search successfully. Active resources may work independently in a disjointed manner or collaboratively in an integrated manner. Knowledge & learning – Because search is a constantly evolving field, is the organization knowledgeable about search and committed to continuously learning? Information can include existing knowledge, past experience, or training in organic search strategy and tactics. It can also include a commitment to learning more, possibly through willingness to undertake trainings, attendance of conferences, regular consumption of learning materials, or staying current in industry news and trends. Means, capacity, & capabilities – Does the organization budget appropriately for and prioritize the organic search program? Means, capacity and capabilities can include being scoped into a client contract, adequate budget being allocated to the work, adequate human resources being allocated to the work, the capacity to complete the work when measured against competing demands, and the prioritization of search work alongside competing demands. At this stage, the organizations’ search application may be nonexistent, unstable, or uncontrolled. There may be rare and small SEO efforts, but they are entirely ad hoc and inconsistent, and retrofitted to the work after the fact, at best. They tend to lack any discernible goal orientation. If SEO exists, it is disconnected from larger goals, and not integrated with any other practices across the organization. They may be just beginning their search practice for the first time. These organizations have started to document their processes and are satisfactorily knowledgeable and competent in search. They have minimum standards for search best practices and process is emerging. 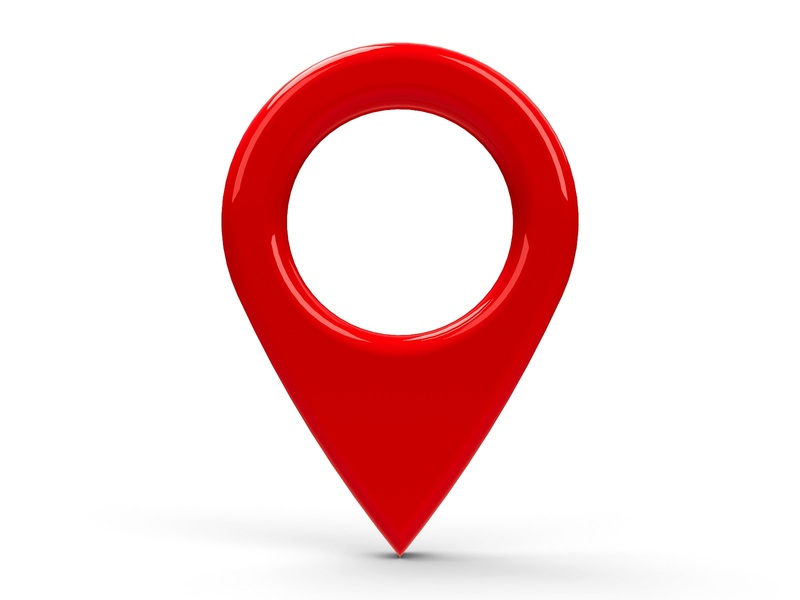 Many people inside and outside the organization understand that search is important and are taking steps to integrate. There is a clear search strategy that aligns to organizational goals and processes. Proactive search preparation and planning happens prior to activating projects. Organizations at this stage have a strong mastery of search and efficiently implementing as a matter of policy. They have cross-organizational integration and proactively work to strengthen their search performance. They are always improving the process through incremental or innovative change. They review and analyze their process and implementation to keep optimizing. These organizations could potentially be considered market-leading or innovative. Before you can know how to get where you want to go, you need to know where you are. It’s important to understand where the organization stands, and then where they need to be in the future. Going through the quantitative exercise of diagnosing their maturity can help everyone align to where to start. 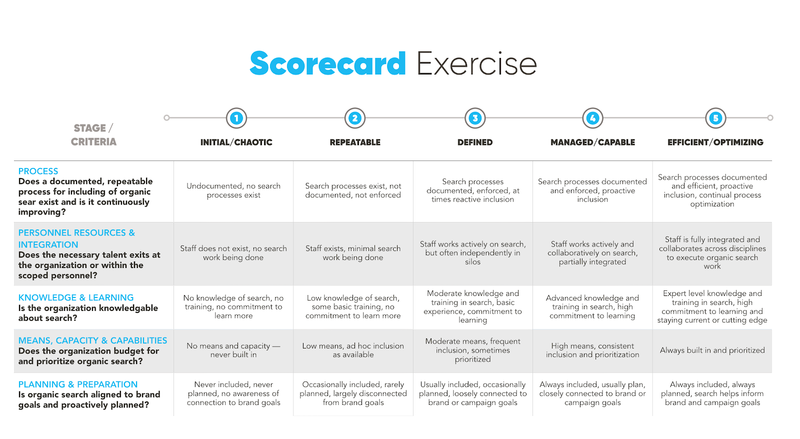 You can use these scorecards to assess factors like leadership alignment to the value of search, employee availability and involvement, knowledge and training, process and standardization, their culture (or lack thereof) of data-driven problem-solving and continuous improvement, and even budget. This should be a deeper exercise than just punching numbers into a spreadsheet, and it certainly shouldn’t be a one-sided assessment from you as an outsider. It is much more valuable to ask several relevant people at multiple levels across the client organization to participate in this exercise, and can become much richer if you take the time to talk to people at various points in the process. Once you download the scorecards, follow these steps to begin the maturity assessment process. Client-side distribution – Distribute surveys to relevant stakeholders on the client’s internal team. Ideally, these individuals serve at a variety of levels at the company and occupy a mix of roles relevant to the organic search practice. These could include CEO, CMO, Marketing VPs and directors, digital marketing coordinators, and in-house SEOs. Agency-side distribution – Distribute surveys to relevant stakeholders on the agency team. Ideally, these individuals serve at a variety of levels at the agency and occupy a mix of roles relevant to the organic search practice. These could include digital marketing coordinators, client engagement specialists, analysts, digital copywriters, or SEO practitioners. Comparing client to agency perception – You may also choose to ask survey respondents to denote whether they are client-side or agency-side so you can look at the data both in aggregate, and by client and agency separately, to determine if there is alignment or disagreement on where the brand falls on the maturity curve. This can be great material for discussion with the client that can open up conversations about why those differences in perception exist. To get your own scorecard, click the image and make a copy of the Google Sheet. The goal is to identify together where to start working. This means finding the strengths to capitalize upon, areas of acceptability that can be nudged to a strength with a little work, weaknesses to improve upon, agreeing on areas to focus, and finally, how to get started tackling the first change together. For a client that is starting on the low end of the maturity scale, it is unrealistic to expect that they have connected all the dots between important stakeholders, that they have a clearly defined and repeatable process, and that their search program is a well-oiled machine. If you don’t work together to solve the underlying problems like knowledge or adequate personnel resources first, you will struggle to get buy-in for the work or the resources to get it done, so it doesn’t matter what projects you recommend. For a client that is advanced in a few areas, say process, planning, and capacity, but weaker in others like knowledge and capacity, that might suggest that you need to focus efforts on an education campaign to help the client prioritize the work and fit it into a busy queue. For a client that is already advanced across the board, your role instead may be to keep the machine running while also helping them spot minor areas of improvement so they can keep iterating and perfecting the process. This client might also be ready for more advanced search strategies and tactical recommendations, or perhaps more robust integrations across additional disciplines. It’s rare that we live in a world of radical change where we overhaul everything en masse and see epic change overnight. We tweak, test, learn, and iterate. A maturity model is a continuum, and brands must evolve from one step to the next. Skipping levels is not an option. Some may also call this a “crawl, walk, run” approach. Your goal as their trusted search advisor is not to help them leap from Stage 2 to Stage 5. Accomplishing that trajectory and speed of growth is exceedingly difficult and rare. Instead, focus your efforts on how the client can get to the next stage over the next 12 months. As they progress up the maturity model, the length of time it takes to unlock the next level may grow longer and longer. Even when an organization reaches Stage 5, your/their work is not done. Master-level organizations continue to refine and optimize their processes and capabilities. There is a French culinary phrase, “mise en place,” that refers to having everything — ingredients, tools, recipe — in its place to begin cooking most successfully. There are several key ingredients to any successful project implementation: buy-in, process, knowledge and skills, capacity, planning, and more. As your client evolves up the maturity curve, you will see and feel a transition from thinking about aspects only once a project is sliding off the rails, to including these things real-time and reactively, to anticipating these before every project and doing your due diligence to come prepared. Essentially, the client can move from not being able to spell “SEO” to making SEO a part of their DNA by moving up these maturity curves. It is important to revisit the maturity model discussion periodically — I recommend doing so at least annually — to level-set and realign with the client. Conducting this exercise again can remind us to pause and reflect on all we have accomplished since the first scoring. It can also re-energize stakeholders to make even more progress in the upcoming year. What’s your top marketing challenge right now? Generating traffic and leads? New business development? Producing engaging content? Every organization is on a marketing maturity path toward more strategic marketing that addresses these challenges at a fundamental (not just surface) level. How far along is your organization on that path? And what steps do you need to take to move to the next step? Read on for a quick snapshot of the progression.